The Mailer Review is published by The Norman Mailer Society and is co-sponsored by the University of South Florida and the Mailer Society. Yearly subscription rates: individuals, libraries, colleges, and universities in the U.S. Postal Zones, $25 for one issue or $40 for two issues. All foreign subscriptions, individual and institutional, are $32 per issue or $58 for two issues. Please contact The Mailer Review Services for subscription information, including back issues. The Mailer Review is available as a benefit to members of The Norman Mailer Society. For membership information, please visit our web site. 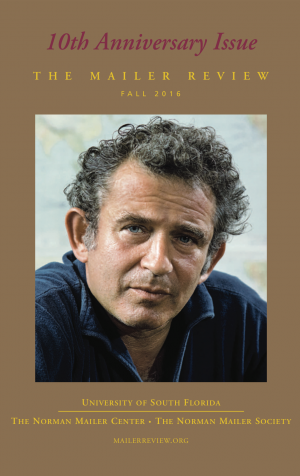 The Mailer Review publishes articles, notes, creative works, cultural/biographical commentary, and book reviews relevant to the life and work of Norman Mailer. All critical approaches are welcome. Authors are responsible for the accuracy of all quotations. An editorial committee reviews anonymously unsolicited manuscripts. Book reviews are assigned. For manuscript guidelines, see our link on the Society web page. Submissions should include an abstract and completed essay, sent as MSWORD attachments to the Editor. Authors should follow current MLA style of documentation.